The AR-5516D’s Scan Once/Print Many (SOPM) function stores a scanned original into memory to quickly produce up to 999 copies of each page at a continuous copy rate of 16 cpm. Moreover, its quick first copy time of 7.2 seconds saves valuable time when performing multiple short-run jobs. For further convenience, an Electronic Sorting function allows the AR-5516D to automatically collate multiple sets of copies in page order without the aid of a sorter. The AR-5516D can automatically produce duplex copies from one- or two-sided originals, thanks to a built-in duplex module. Duplex copying is even more productive when the optional 40-sheet Reversing Single Pass Feeder (RSPF) is used along with the module. The AR-5516D comes standard with such image-editing functions as XY Zoom, Dual Page Copy Mode, Rotation Copy, Margin Shift, Edge/Centre Erase, and 2-in-1/4-in-1—all of which make copying more convenient. The AR-5516D is a high-performance printer that incorporates Sharp Printer Language with Compression (SPLC) technology. SPLC effectively reduces the data size of print jobs, speeding up the transfer of data and the printing process while improving overall throughput. Another timesaving function, RIP Once/Print Many (ROPM), saves print data in the machine’s internal memory and transfers it to output at a fast rate of 16 ppm. 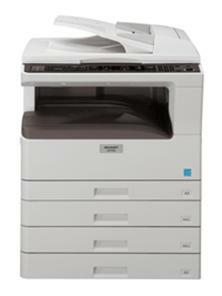 When it comes to document management, 600 x 600-dpi B/W scanning capability on the AR-5516D is a definite efficiency booster. Scanning paper documents into digital form makes them easier to organise, saves filing space, and rids your office of unsightly paper pileups. Operation is quick and easy—simply press the Scan button, select an application, and press Start. Up to six pre-registered applications are available, including e-mail*, Microsoft® Word*, OCR*, PC-fax*, and a different application of your choice. Button Manager allows you to change/assign these destination applications and scan settings, while the optional Sharpdesk desktop document management software lets you easily organise, search, edit, and distribute your scanned documents. * These applications require additional software. The AR-5516D comes standard with a 250-sheet front-loading paper tray and a 100-sheet multi-bypass feeder. Two additional types of paper drawers are available for a total paper capacity of up to 1,100 sheets.